A little boy on a boat watches as a whale is about to breach. Suddenly, time stops still ... and we find a completely different world, in which the ocean is as solid as glass. In this world, people walk freely upon the surface of the ocean, contemplating and admiring the whale's leap over the period of an entire day. We get to see the equally surreal stories of the observers. Then, finally, we return to the boy, who watches the whale complete its leap as the boat moves on in regular time. Hey, how'd this hookah get in here? I thought we didn't allow smoking on the premises! Sorry about that, you're here to read the review for Grassy Glassy Ocean, aren't you? Well, having rated titles as esoteric as Angel's Egg and Night on the Galactic Railroad, you may assume that I've acquired an eye for art films. I'm not so sure that is the case, for Glassy Ocean's indulgent and often incomprehensible storyline had me always a second away from hitting the little [x] on the top right corner of my WinAmp player. While a bit of surrealism is occasionally interesting as background, it rarely suffices as the entire point of a work, and it just doesn't work here. Angel's Egg, for example, asks existential questions and stays within a largely coherent narrative, becoming a deep, complete work without more than a handful of words of dialogue. Glassy Ocean takes the opposite route, drowning the viewer in surrealistic ideas, random tangents, and a stream of dialogue that obfuscates the entire work. It begs the viewer to accept the setting, which would be fine if the setting weren't entirely nonsense to begin with. Of course, most people don't watch art films for plot, so how's the art and animation? Well, the art style is minimalistic and closer to, say, European works, but without much of the charm. Also, while this was considered high-tech for 1998, the 3D animation looks like a graphic design school's student work, or maybe a tech demo, designed to be shiny, rather than to actually make sense. Faring far worse is the 2D animation, which is primarily reminiscent of Flash websites. Frankly, Homestar Runner looks better and tells a more coherent narrative than Glassy Ocean, and no one would ever accuse that particular title of being an art film. Despite the plethora of dialogue, I feel that the quality of the voice acting in this show is largely irrelevant. You could have James Earl Jones on the microphone for all I care, and this show would still be complete, utter nonsense. You just can't stand out when the material is so obtuse - honestly, it would've made more sense if every single character in this show were portrayed by mimes. So what is Glassy Ocean? To put it simply, imagine Angel's Egg with absolutely no emotional or philosophical depth, and very little substance to back visuals that already seem quaint and dated. Most anime fans would have no interest in this title to begin with, but I imagine that more cerebral scholars of anime might want to give this a try. Glassy Ocean is indeed surreal, but it's like the interpretive dance air show I saw the other day on HDTV. Weird? Yes. Good? Necessary? Anything but a waste of time? No way! 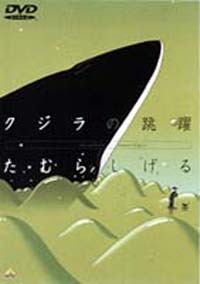 Don't be fooled - this whale's leap is not an obscure animation gem, but simply one big ball of glass. Recommended Audience: Absolutely nothing objectionable to be found. Even at twenty-two minutes, probably too slow for most.